Eaten alive by mosquitos in America's first National Park dedicated to preserving an eco-system rather than merely geologically impressive features. 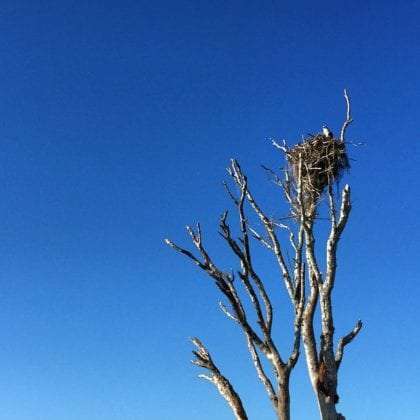 Two osprey perch stalwart in the dead standing snag that was once a fig tree. It’s well after dark, and my bicycle provides relief from the innumerable individuals constituting a mass migration of mosquitoes in Flamingo, Florida–the southeastern part of the park–as long as I keep moving. The birds’ silhouette was hard to miss in the near full moonlight though, and spying on their nightly endeavors was impossible to pass by. It’s a jungle down here. Bald cypress trees, conifers (like a line or spruce) scientifically, they reject their kind’s evergreen tendencies in favor of shedding their leaves for the winter. Interesting choice, considering how rare a Florida winter it is when it’s cold enough to warrant such behavior. But they’re the tallest trees around, and so I suppose can do as they please. Biscayne National Park is closed for New Year’s Day. Much of the Flamingo area of Everglades has been closed since a hurricane obliterated services in 2005, the civilization of it all anyway. Whats left of these swamps is free for the licking, all one must do is have a kayak or canoe, and a willingness to brave the Mosquitos. Evening falls into night. I park my bike. What’s left of the awake portions of my family are huddled around a grill, which is built a small campfire in earlier, trying to drench themselves in smoke, a last ditch effort to prevent bug bites when even the Off! falls short of effectiveness. Eventually, we all retire. Half of us are prone to bites. The other half not so much. I’m luckily the least attractive to these little bloodsuckers, and so sleep through the night peacefully, partially drunk, fully sound and dreaming. The morning sun comes out of the Atlantic with its daily promise of new. Everyone gathers in the Airstream to discuss their tossing, turning last night. Winter, our 2 year old, took the brunt of the attack. Very little of his milky white Caucasian skin is not riddled with lumpy red sores, some of which he’s already scratched to bleeding. The ladies pack up the house and I take my boys off for one last round of exploration. Yes, the insects have one, and we’re cutting our 5 day stay here short after just one night. 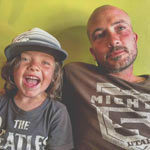 So to make the best of a bad situation, all three boys and I venture off while the Airstream is readied for departure. In a matter of hours we see enough to justify the several hours it took us to get here. Great blue herons tip toe through murky brackish waters, anhinga stretch their black wings out to bask in the sun, and herrings of all dimensions tour the skies above. We’re told some crocodiles are nearby, and try to glimpse a peek, but instead are greeted by a manatee only willing to show us his nose. A ranger discusses how most of the tropical species–from coconut palms to various lizards–all migrated here from further south. Coconuts float, lizards ride leafy boats. Florida is a rarity, unique in the United States. It’s more a different world than anywhere else in this nation, because for everywhere else, there’s somewhere similar. But here, it’s just the jungle, swamped out and full of prehistoric looking creatures and their plant-life counterparts. Our wheels begin to roll and we’re headed north. We’ll arrive in Big Cypress National Preserve, still technically the Everglades, just not officially part of the national park.